I’m seriously loving Twitter at the moment: 140 letters to say something banal and ordinary. If you haven’t had a look, find me here. 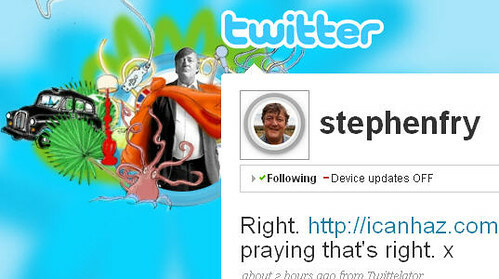 Who doesn’t love Sir Stephen Fry? Cuddly, clever, witty, delicious, funny, tweedy, Twinings, Twinings, Stephen Fry. His Tweets are exactly as you would expectâ€¦ and yes it really is him. He’s filming a series in Africa right now and telling us all about it. Lovely. From national treasure to national government, (did you see what I did there? Did you?) Number 10 Downing Street is twittering too. Of course, there’s the usual round of policy announcements and appointments (which are a teeny weeny bit dull) but also a fair bit of gossip and meat to keep us interested. For instance, when the PM was in Japan the Twitterer-in-Chief was there too telling us all about it (sounded like bloody hard work) and we got the inside scoop when they found a kestrel in the garden. In general I’m pretty impressed and surprised by Downing Street and how they’re using not only Twitter but also Flickr. There tweets are better, for instance, than both eBay and oh-so-trendy-Obama. Not sure how soon arm will freeze after 1st heater is turned off. Depends on the weather. But saving that power (250 watt hrs/sol) is good. It’s a bit stormy today. Not sure if these are dust or ice clouds, but the sky is more obscured & less sunlight is hitting my solar arrays. PayPal Twitter hack: won’t someone remember the Community Manager? I love how Stephen Fry spends two characters out of every 140 putting kisses in his tweets. largely for the sigh of relief I give every time I see “Northern line has severe delays”.